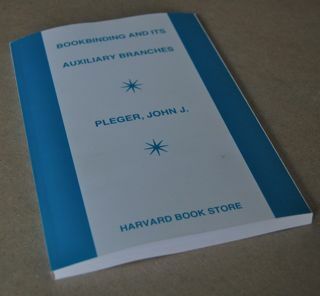 Jeff Altepeter, Bookbinding Instructor at North Benett Street School, gave me a copy of John J. Pledgers’ “Bookbinding and its Auxiliary Branches” which was printed on demand by the Espresso Book Machine. For expensive, hard to find books, the Espresso is great for people like me who basically want the textual information, and have difficulty concentrating while screen reading. The Espresso bills the books it makes as a “Library Quality” binding. I’m not quite sure what this means, or even if this is a good thing, but the book is similar in quality to a mass produced paperback, with slightly better quality paper. 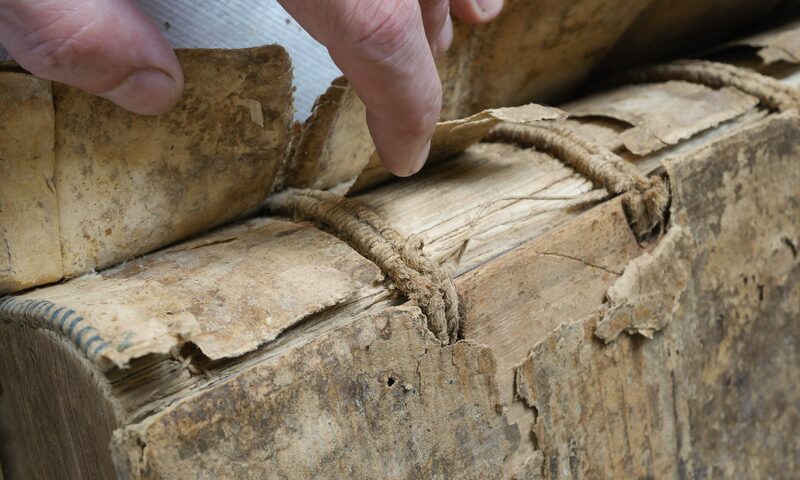 The cover is lined up and it is well trimmed, but there is a suspiciously dark colored glue on the spine. If the grain of the paper ran head to tail, it might even open fairly well. For $8, however, it is cheaper and easier to read than a photocopy, though the images are a bit worse in quality. 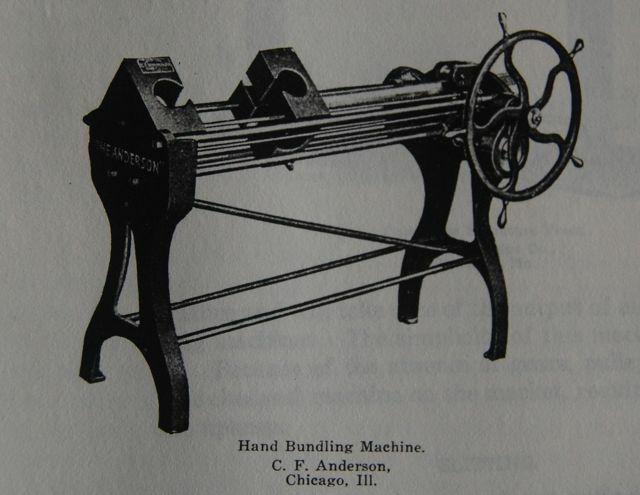 In many ways, the Espresso is getting close to the ultimate goal of bookbinding machinery inventors– to print and bind a book without human intervention, relatively inexpensively and reasonably durably. Below is the same image from three versions of this book for comparison. Fig. 1. Screen shot from Google Books. Fig. 2. 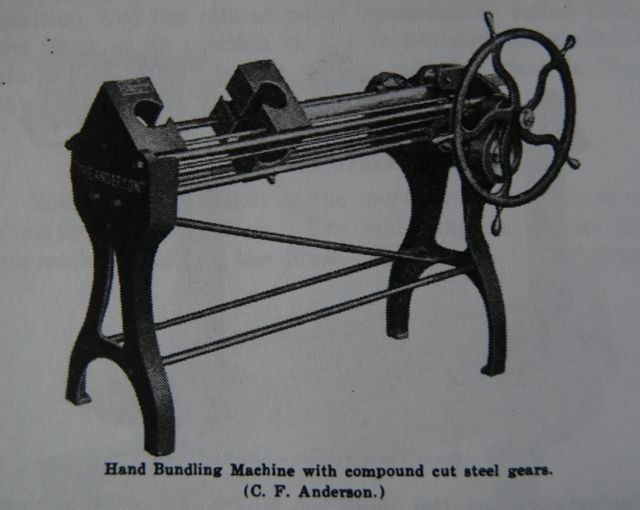 Image from the Espresso Book Machine Printing, using the Google Scan. Fig. 3. From a photocopy I made in the 1990’s, from the Revised edition of 1924. Interesting to see something from the Espresso machine. I recently signed up with Lightning source for printing the new series of reprints. In addition, I signed for the Espresso machine even though there are only a few out there. The quality does not approach that of the regular Lightning source perfect bound or hard cover books, but what can you expect from a juiced up printer? That dark glue certainly does detract. I’m wondering how it compares to the standard adhesive they use. The Espresso adhesive almost looks like your average hot melt glue. I think I’ll dig up some of the patents and see if I can find out what it is. The proof copies I received are well above average which I would expect, given that Lightning Source is the largest printer of their ilk in the US. The downside is that so many of the Google book files are so messy. I wonder what they will look like when printed on this contraption? In any event, Espresso makes it affordable for European and academic buyers to get a copy without paying extra for shipping. Then there is the Google Books legal matter, which is up for resolution in the very near future. And that all depends on what the presiding judge says about the so-called Google/Author/Publisher agreement. I hope the judge leans towards the monopoly strategy and finds against Google. I like my books open market rather than controlled! Nuff soap-boxing. I’ll hie over to the Espresso machine at the Harvard COOP and see what I can get out if it when my titles come online. Thanks for the info. I wonder if it might just be a bad batch of glue on my book? I hadn’t heard of Lightning source and will check them out. As for Google, I totally agree. Robert Darnton, University Librarian at Harvard, considers the decision on this dispute one of the most important in human intellectual history. I hope it is not in the current version, but an earlier version let Google censor up to 15% of titles without having to inform anyone. Frightening. 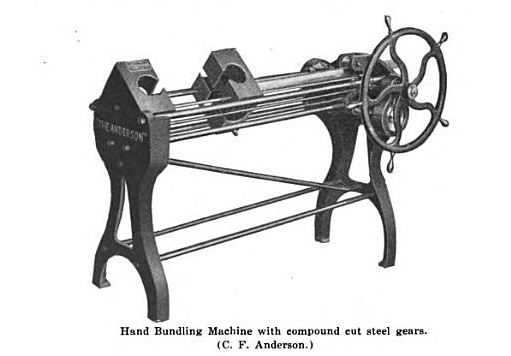 Lightning Source is the printer arm of Ingram. From my library days, it’s safe to say that a vast array of the books you read that are perfect bound TP or HC originated at Lightning Source. As for Google, as a former librarian, Google and Wikipedia were at the top of the ‘can’t live with them, can’t live without them’ list. Then again, if not for these two gorillas, the reference desks of the world would have much less work. It’s incredible just how much misinformation these two produce.